I will perform the three Piano Sonatas by Pierre Boulez (1925–2016) this coming Tuesday at the House of Nobility in Helsinki at 7 pm. The concert, Pierre Boulez in memoriam, is a part of the Key Discoveries Piano Festival, which brings to Helsinki such masters of the keyboard as Roland Pöntinen from Sweden and Alexei Lubimov from Russia, and features an excellent line of pianists from Finland including Tuija Hakkila and Risto-Matti Marin. Following specific instructions by Boulez himself I frame his sonatas this time with a selection of Études by Claude Debussy (1862–1918). When I first met Pierre Boulez in Paris in 2001 to perform the Second Sonata for him, following our session I had a chance to sit down with the composer. Among the many things we discussed–I bombarded him with questions about various composers such as Liszt, Dutilleux, and Carter–I asked which pieces he would like me to present alongside the Second Sonata in recital. His answer was: “this may seem funny, but the Hammerklavier” – I added: “but Sir, that’s not yet a full program” – and Boulez:” begin with a selection of Études by Debussy”. It took me nearly a decade to prepare a program coupling the two giants, the Second Sonata and Beethoven’s Hammerklavier. I finally performed the tandem at Festival Messiaen in La Grave, France in 2010, when Boulez’s music was in focus at the festival and he too was there. Sadly, he had to miss the performance due to a rehearsal of Le Marteau sans maître, which he was conducting. And, as an unfortunate result, I believe that he never actually heard the two alongside each other in concert, even though various people have performed the coupling. Anyway, since then it has taken nearly another decade for me to come up with the Debussy. By now, as we know, Pierre Boulez has passed away. Following a similar event in Boston last year, this concert is my Finnish homage to Boulez with whom I was extremely fortunate to study the three Sonatas. 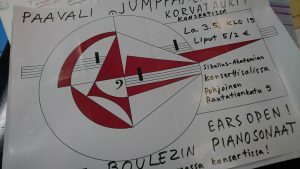 A bit of a silver lining to the event in Helsinki is the participation of the Ears Open Society, an organisation dedicated to new music and lead by young Finnish composers and students of composition. The Key Discoveries Festival, which is curated by the intensely curious piano virtuoso Martin Malmgren, is donating part of the ticket sales towards the Society’s work. By silver lining I mean that when I performed the three Boulez Sonatas for the very first time in one program, a couple years after that first meeting with Boulez, and at that time preparing to record the Sonatas upon Boulez’s request, it was the Ears Open Society who organised the event. I actually dug op the poster for that concert, see below. Since those days, I’ve often performed the Boulez Sonatas, from time to time in a program featuring all three. But preparing this time to introduce each one with an Étude by Debussy has been truly inspiring. The sensitivity of colour and preciseness of texture in both composers’ music should be apparent. However, whereas in Boulez’s case it is possible to miss those aspects (mostly because of the massive virtuosic demands of his piano writing), in the case of Debussy, it is nearly impossible. In addition to those aspects, some uniting features exist. For one, the Schoenbergian inwardness of Étude No. 3 Pour les quartes (to me even more central characteristic of the piece than the radical harmonies created by the fourths) and other, as given away in the title of the Étude No. 10 Pour les sonorités opposées, contrasting sonorities, resonate in profound manner with Boulez’s music. Posted in Composers, Concerts, Festivals, New Music. Bookmark the permalink.